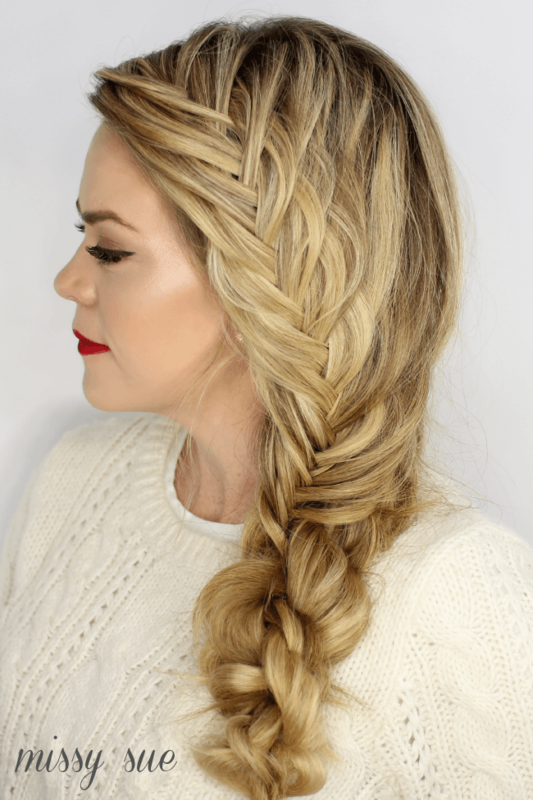 Mixing things up and wearing a fishtail braid is a perfect step for the coming Spring. 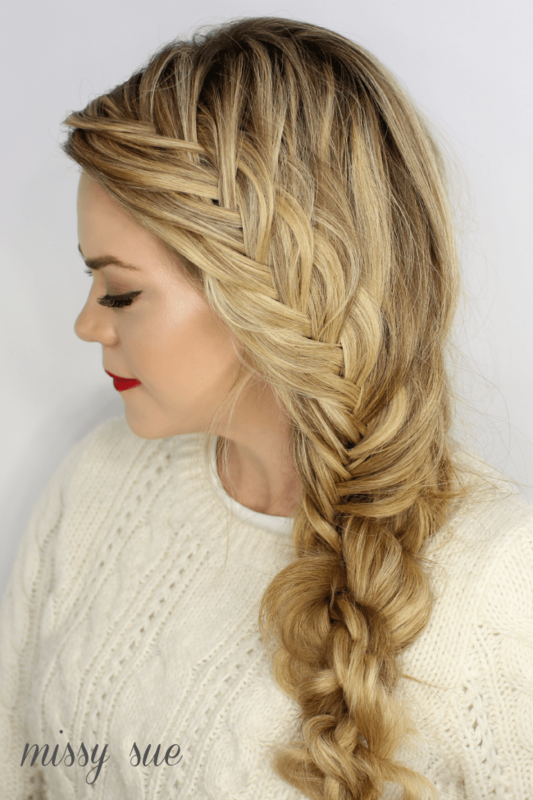 Create a tight braid for an ultra-chic look or wear it loose for a more carefree feel. Then finish it with a knotted side braid to change up that regular braid so you look more done up. It’s a whole lot easier than it looks too so scroll down to the tutorial below and let’s get braidng! Step 1 / Part the hair on the right side and sweep all the hair over the left shoulder. Step 2 / Pick up a section on the heavy side of the part and divide it into two strands. Step 3 / Take a small section from the back half, cross it over the top and add it into the front half. Step 4 / Separate a small section from the front strand, cross it over the top, and incorporate it into the back strand. Step 5 / Cross a small section from the back strand to the front strand and bring in a section of hair crossing it over to the front strand. Step 6 / Now repeat step 5 with the front strand. Step 7 / Continue braiding the hair down in a fishtail french braid until it reaches the bottom of the left ear. Step 8 / Once the braid reaches the ear, create a knotted side braid. To do this, twist the two strands forwards then cross them over each other in the opposite direction. Step 9 / When it reaches the bottom, tie it off the end with a clear elastic. Step 10 / Create a second rope braid with the remaining hair and tie off the end. Step 11 / Next, pull apart one of the rope braids to make a gap and pull the other rope braid through it. Step 12 / Keep pulling the braid through gaps in the other one so the two are combined. Step 13 / Tie the final braid together and remove the other two elastics. Step 14 / Gently loosen the sides of the braid to make it fuller and look more intricate. Gorgeous! wish that I could braid like that!